FDA To Limit Nicotine In Cigarettes : Shots - Health News The Food and Drug Administration wants to reduce nicotine in cigarettes to levels so low that millions of smokers will be able to quit and millions more people will never take up the habit. The Food and Drug Administration is proposing to cap the amount of nicotine in cigarettes to make them less addictive. "Despite years of aggressive efforts to tackle the leading cause of preventable disease and death in the United States, tobacco use — largely cigarette smoking — still kills more than 480,000 Americans every single year," FDA Commissioner Scott Gottlieb said in a statement. "Given their combination of toxicity, addictiveness, prevalence, and effect on non-users, it's clear that to maximize the possible public health benefits of our regulation, we must focus our efforts on the death and disease caused by addiction to combustible cigarettes," he said. The FDA hasn't yet decided exactly how much it will cut nicotine or how quickly. But the goal is clear. In a Federal Register notice that is expected to be published Friday, the agency said it "is considering developing a proposed product standard to make cigarettes minimally addictive or nonaddictive by setting a maximum nicotine level." The agency cited research that could support reducing levels of nicotine to 0.3 to 0.5 milligrams per cigarette. The nicotine levels delivered by conventional cigarettes made domestically are in the range of 1.1 to 1.7 milligrams, according to the notice. Cutting nicotine to 0.4 milligrams could help about 5 million adults smokers to quit within one year and prevent more than 33 million people from becoming regular smokers by the year 2100. The shift could reduce the current U.S. smoking rate from 15 percent to as low as 1.4 percent, the FDA said, and prevent 8 million tobacco-related deaths by the end of the century. 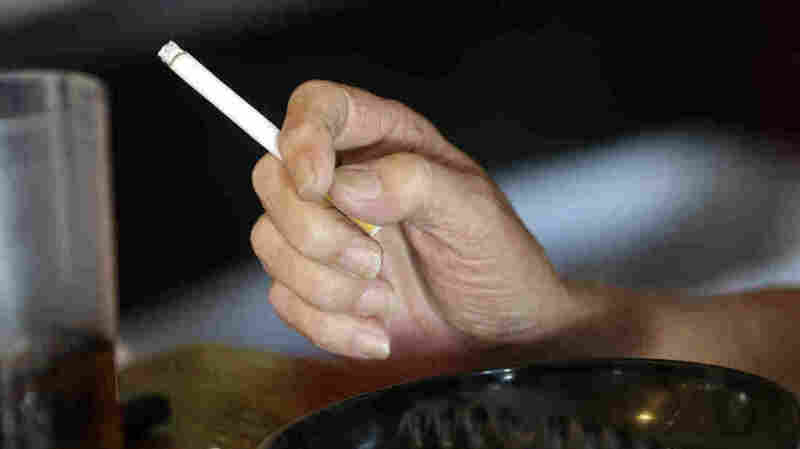 The FDA's move was welcomed by anti-smoking advocates. "The announcement today is potentially the most significant public health step the Food and Drug Administration has taken in decades," says Matthew Myers, who heads the Campaign for Tobacco-Free Kids. "The benefits laid out in this proposal are of such an extraordinary nature that it compels rapid action. It is a public health urgency to move forward rapidly." The FDA announced preliminary plans to cut nicotine in cigarettes in July but didn't make any specific proposals. The Thursday announcement marks the first formal step towards making that plan a reality. But the latest announcement also makes it clear that no firm decisions have been made and that many factors have to be considered before taking such a drastic step. One concern is that cutting nicotine in cigarettes could result in smokers smoking more or inhaling smoke more deeply to compensate. Another concern is that slashing nicotine could lead to a black market in high-nicotine cigarettes. But the FDA says research has indicated that there may be ways to prevent such negative outcomes. Although the move could be a significant blow to the tobacco industry, initial reaction from companies was muted. "As this process gets underway, we look forward to working with FDA on its science-based review of nicotine levels in cigarettes and to build on the opportunity of establishing a regulatory framework that is based on tobacco harm reduction and recognizes the continuum of risk," said an emailed statment from James Figlar, executive vice president of research and development for R.J. Reynolds Tobacco Company. The FDA also says it will be seeking comment on additional new regulations of the tobacco industry, including possibly limiting menthol in cigarettes.